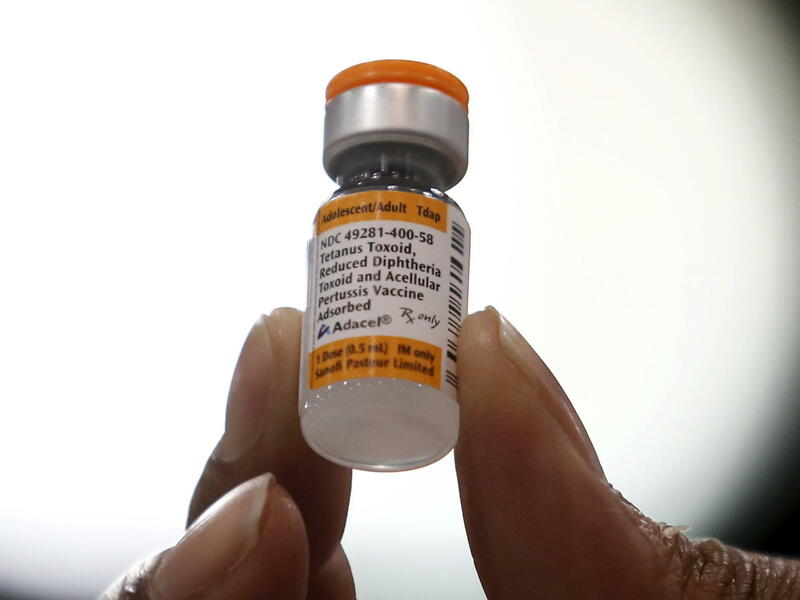 A nurse holds a tetanus, diphtheria and whooping cough vaccine in 2016. Physician Judith Guzman-Cottrill tells NPR that she has met many families who hesitate to give their children vaccines. A new report published by the Centers for Disease Control and Prevention details the harrowing story of a child in Oregon who contracted tetanus because he wasn't vaccinated. The boy was playing outside on a farm in 2017 when he cut his forehead. Six days later, he started having symptoms: a clenched jaw, muscle spasms and involuntary arching of his neck and back. When he started struggling to breathe, his parents realized he needed help and called for emergency medical services. Doctors diagnosed the 6-year-old boy with tetanus and administered a dose of the vaccine, but it took 57 days in a hospital, including 47 days in intensive care, to restore his health. "It was difficult to take care of him, to watch him suffer," says Judith Guzman-Cottrill, a pediatric infectious-disease physician who co-authored the article in the CDC's online journal Morbidity and Mortality Weekly Report. At first, he asked for water but couldn't open his mouth. The boy had to spend weeks in a dark room on a respirator. He was able to walk 20 feet, with help, after 50 days. At a time when preventable outbreaks are making headlines in the United States, Guzman-Cottrill tells NPR that she has met many families who hesitate to give their children vaccines. "These days, there are so many different places parents can go to for vaccine-related education and advice that many families struggle with knowing who to believe." The Internet and social media have made it harder for people to distinguish fact from fiction, she says. The boy's infection marked the first pediatric case of tetanus in the state of Oregon in more than 30 years, according to the researchers. After allowing the first dose of vaccine, the parents refused a second dose for their son, despite doctors giving them information about the advantages of being immunized against tetanus. "I did provide education about the benefits of all pediatric vaccinations and that was also refused," Guzman-Cottrill says. The report of his illness comes after outbreaks of measles occurred this winter in the Pacific Northwest. Measles is also preventable with a vaccination. The rise in measles cases, spurred by the anti-vaccination movement, is pushing authorities to address the issue. On Tuesday, 18-year-old Ethan Lindenberger told lawmakers that his mother prevented him from getting immunizations because her Facebook feed turned her into an anti-vaxxer. Facebook itself announced Thursday that it is using vaccine hoaxes identified by the World Health Organization, the CDC and other global organizations to address inaccurate information plaguing the site. "As a parent myself, I understand that parents are trying to make the best decision for their child," Guzman-Cottrill says. "This illness could have been prevented with five doses of the tetanus vaccine, for $150," she adds. Instead, the ordeal cost $811,929.